Mercedes-Benz has let out a teaser for the upcoming facelifted Mercedes-Benz GLC Coupe. The regular GLC debuted its mid-cycle refresh at the Geneva Motor Show earlier this month, and the coupe should get most of the updates seen on that SUV. 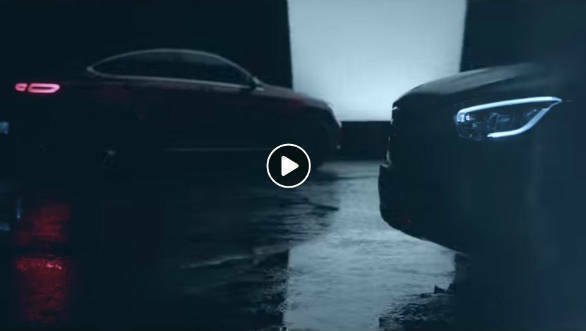 The teaser shows that the silhouette of the coupe-SUV remains unchanged. New are the LED DRLs and headlamp elements up front and reworked tail lamps. Expected are a smaller grille and new bumpers. The interiors remains unchanged more or less with the biggest news being the addition of the MBUX driving assistant. Other tech like collision avoidance, lane change assist and route-based speed adjustment should also be available. 4MATIC with 250PS and 500 Nm. The quickest petrol will be the 260PS and 370 Nm, GLC 300. A 10 PS boost from the e motor is also available. The GLC Coupe will compete with the recently launch BMW X4 when it launches in India in a few months. Ecpect prices to hover around the Rs 70 lakh mark.